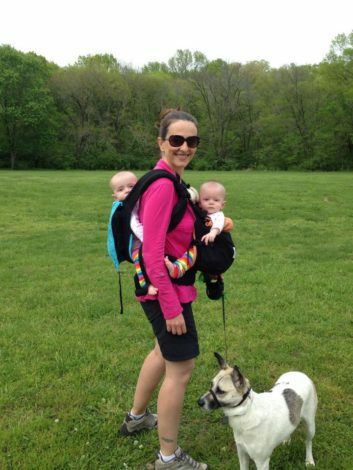 Hike it Baby was so lucky to partner in our last HiB30 Challenge in March with Krystal Workman from TwinGo. She loved what Hike it Baby was doing and we loved that she was a twin mama helping other twin mamas just get out there. 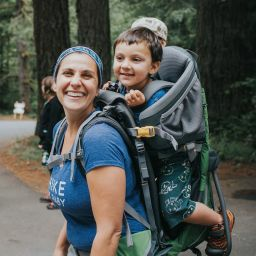 Since Hike it Baby is always looking to feature innovative mamas who are making products that work for other families. Here’s a bit about how she started her company. And check out Gabrielle Epstein who won a Twingo last HIB30! People really do win cool stuff so register today! Registration closes June 10th! When did you first think up the idea for the TwinGo and what was the impetus for it? In early 2010, my twins were born 6 weeks premature so my babywearing experience started in the NICU with Kangaroo Care. 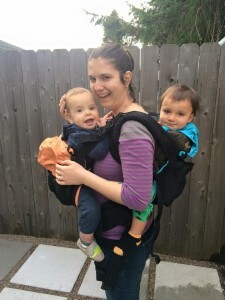 In late 2010 I started wearing the twins front/back in two separate carriers. Tandem babywearing empowered me to do more than what I had initially set out to accomplish—I was able to leave the house alone without a stroller, keep both my babies close while still having hands free to multitask, and I didn’t have to choose whose tears to sooth during those witching hours. However, wearing two baby carriers at the same time—one on front and one on back—had its drawbacks. The bulkiness of two sets of shoulder straps on my petite body and overlapping waist belts were just some of the issues I experienced. In early 2011 I decided to make my own DIY tandem baby carrier that was efficient to use with ergonomics in mind—this was the beginning of the TwinGo Carrier. Less than 1 year later I filed for a patent, registered my business in Virginia and started selling prototypes in 2012. Tell me what your early challenges with creating the design were? timeline. I have been able to create a carrier that families can afford without sacrificing quality. Was the design process fun for you? certain aspect of the carrier or how the carrier is empowering them to be the parent they want to be. What were some of the first things you noticed about when you could double carry? 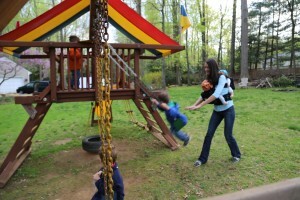 drawbacks of wearing two carriers and improve the efficiency and safety of loading and unloading children. It also provides a comfortable solution to balance the weight around the wearer on their hips. 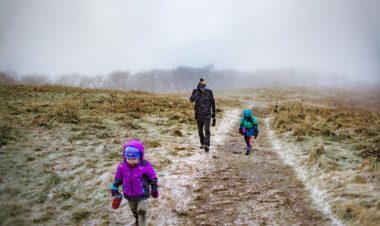 I am 5’1” 100 lbs and I tandem carried my twins from 5 months up to 30 months and single carried my twins from newborn to 3+ years. What are some of the key features of the TwinGo? The best feature of the TwinGo Carrier is that it’s 3 products in 1: it is a tandem baby carrier for 1 adult to wear 2 babies in a front/back position AND it can be divided into 2 separate carriers for 2 adults to wear 1 child each on the front or back. This feature is incredibly important for parents of multiple children as child care and/or environmental situations are always changing. The TwinGo sports 2 sleep hoods to support the sleeping babies’ heads in an upright position. The hoods also provides a protective covering in the sun and a privacy barrier when breastfeeding. The TwinGo has two extra-large pockets for a diaper bag free outing or serve as a protective case for compact storage. The TwinGo Carrier was designed with safety in mind; the carrier uses color to serve as a usability indicator and features various sized buckles to avoid misconnections. How does it differ from other twin options? The TwinGo Carrier is the first ergonomic carrier for babywearing two children at the same time (one on the front and one on the back). 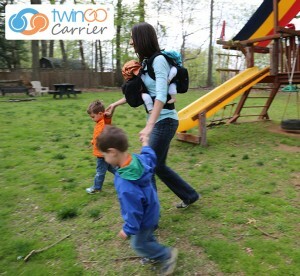 The TwinGo is the only twin carrier that can divide into two separate ergonomic carriers for two adults to wear one child each on the front or back. Parents of twins need the versatility of one or two carriers to accommodate the changing environments and situations. With TwinGo, you get 3 products for the price of 1! babies heads in an upright position when they fall asleep; the hoods also act as a protective sunshade when outside or privacy barrier when breastfeeding. Each TwinGo has large pockets for a diaper bag free outing and the entire carrier can fold into their respective pockets for compact storage to keep the carrier clean. The pockets can hold multiple diapers, wipes, keys, phone, wallet, snacks, etc. Though the pockets are large, they are not excessively large to create unnecessary bulk or added weight like a backpack. Each carrier is lined with a layer of padding to provide a soft barrier between the baby and the items in the pocket. TwinGo is a high-quality carrier made of soft fabric and premium parts. The carrier has gone through extensive safety testing in both the U.S. and Europe. We have designed the carrier to be intuitive to use with safety in mind; for example, the various buckles are different sizes to avoid misconceptions and the two pouches are different colors (blue and orange) so the user knows which pouch goes where. I love the pockets they are the best I have seen out there, how did you think those up? keys, wallet, cell phone, snacks, etc.) but not too big that it affects the balance and overall comfort. Do you have any great TwinGo stories your “fans” have shared with you and do you find mamas are constantly emailing you thank you for your creation? Tell me about the Traveling TwinGo program. 11. What is your background pre-designer? Pre-TwinGo my profession was a multimedia specialist/cartographer who has served in various leadership roles through the years. I absolutely LOVE Hike it Baby because in my college years I was the President of the Geography Club, where I planned regular campouts and hikes to expose college students to the beautiful sites of the local area. Post twins, I served a few years as President of my local twins club of 600 families helping parents connect and mentor each other. I am an optimistic, out-of-the-box thinker who is motivated intrinsically to make the lives of those around me a little brighter.